Ai - Harmony, Love, Unity; to join or become one with. The word carries the feeling of the strength and power of natural forces. Ki - Spirit; Universal Breath, life force or vital energy; the essence of universal creative energy. Do - The Way or Path. “The Way” means to be one with the will of the Universe and embody its function. 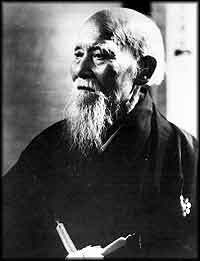 Aikido was founded in the early 1940’s by Morihei Ueshiba (O’Sensei). It is based upon the ancient Japanese fighting arts of Aikijujutsu, Jujutsu, Sojutsu and Kenjutsu. From these roots, Aikido has been transformed into an art of non-aggression. Aikido is more than a physical martial art. Into its practice are woven elements of philosophy, psychology and dynamics. Aikido is the lifelong study to unify life’s energies (ki); to find harmony with our environment and to become centered within. The practice of Aikido is an exercise in developing the mental and spiritual sides of ourselves along with the physical side into a unified state. The movements of Aikido are designed to keep a physical attack from interfering with this unified state. The techniques use spherical movements to redirect forces to bring an attacker under control. The basic posture of Aikido is the triangle with one’s body relaxed and centered. Aikido is meant to create personal and social harmony. Along with the effectiveness of our techniques, we especially concentrate on developing this harmony in our daily practice. Aikido classes generally have a happy and relaxed atmosphere at all levels of training. While the sound of heavy falling and bodies rolling fill the dojo, we still experience joy, gentleness and a sense of trust with our partners. We train in Aikido to enjoy the nature of training. It is the opportunity to learn how to reconcile the conflicts in our lives which has attracted most of us to Aikido and has kept us training. Aikido North was founded in 1984 and is affiliated with the California Aikido Association (CAA), under the guidance of Frank Doran Shihan. The CAA is affiliated with the Aikikai Hombu Dojo, headed by Aikido Sandai Doshu Moriteru Ueshiba (grandson of the founder of aikido), in Tokyo Japan. Aikido North head instructor and Dojo-cho is Calvin Koshiyama Sensei. New for 2018! Your first week of training is now free of charge; come give Aikido a try with no obligation. Aikido North is a non-profit organization.